Heavy rains with thunder and lightning have descended upon the Russian capital. Though experts warned of the dangers of using cell phones during the storm, many people braved the weather to capture frightening images and share them on social media. Over 40 percent of a typical month’s rainfall hit Moscow in a single day on Monday, the city weather bureau reported. 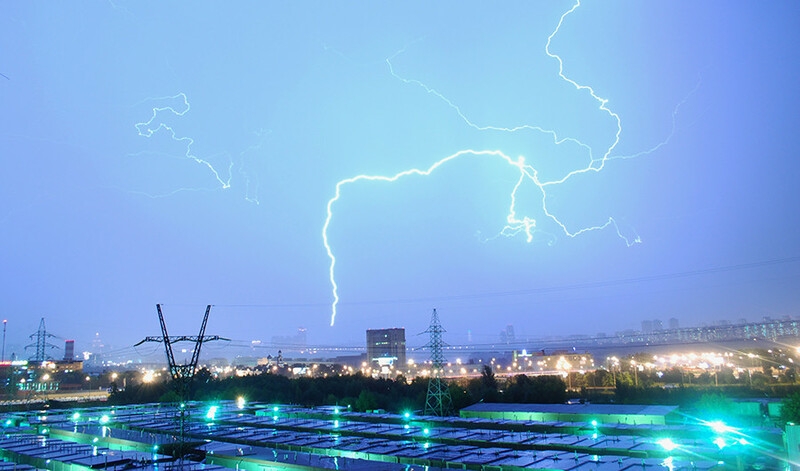 Though dozens of streets were flooded and around twenty flights cancelled at Moscow airports, it was the lightning that caused most of the stir among Muscovites on Monday. One man was killed and a woman injured in separate incidents involving lightning in Moscow, news agencies reported. The woman was hit by lightning in a park, while the man had reportedly sought shelter from the rain under a tree. The risk of being hit by lightning increases with the use of mobile phones during a thunderstorm, Evgeny Tishkovets, a specialist from Fobos weather center, told RIA Novosti. Lightning comes second (after floods) on the list of the deadliest natural forces, he said, adding that around 700 people are killed by such electrical discharges globally every year. Still, many people were seen out in the storm pointing their devices towards the ominous, black Moscow skies on Monday, with people on social media later jokingly speculating as to how many other “crazy” Muscovites had been out with their cameras instead of hiding under a blanket. На одно и тоже можно смотреть с разными ощущениями, и вот они все, как мне показалось .. Дико похоже на человеческие эмоции..